The army of the British East India Company went to war with the Gurkha kingdom of Nepal in 1814. It took two years of hard fighting before the small Himalayan state was subdued. However, the British had been so impressed with the ferocity of the Gurkha soldiers that the kingdom was allowed to maintain a nominal independence, while the British won the right to recruit Nepalese into their army. Gurkha regiments became elite shock troops in many of the subsequent conflicts fought by the British Empire and commonwealth. This unique recruiting partnership continues to this day. The Batavian auxiliary cohorts served a similar role for the Roman imperial army. Auxiliary in general usage can mean supplemental or even secondary, but auxiliary cohorts were not necessarily second-class troops. They came in two types. One was a short-term militia recruited as needed from local natives for the duration of a campaign. Such units were used “come as you are” with their own weapons, organization and leaders. The more regular type of auxiliary unit had a permanent structure and often had a long-term partnership with a specific legion. In both cases, auxiliaries were often raised as specialist troops in areas where the regular Roman army was weak (cavalry both heavy and light, missile troops, marines). The regular auxiliaries often had a mix of Roman and native arms and armor. Some of these units, the eight Batavian cavalry cohorts among them, were certainly veteran and elite troops. Roman horn-players, from Trajan's Column. Batavi is a latinized form of a Germanic tribal name, probably close to Batauen. Like many German tribal names, the meaning is geographical, and derives from two elements, bat, meaning good or excellent, and avo meaning land (and so related to the “ow” element in the modern English word meadow). The tribal name then simply meant “the people of the excellent meadow”. The modern Dutch region called the Betuwe is still a rich agricultural region. Roman auxiliaries cross a river. 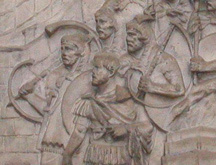 From Trajan's column. The Batavians, since at least 12 B.C., were one of Rome’s earliest and most staunch German allies, providing both mounted and foot troops. The Romans held their skills in horsemanship and swimming in high regard – for the men and horses could cross the Rhine without losing formation, according to Tacitus. This was a useful skill indeed considering their homeland was bounded by two major rivers, intersected by many smaller streams and subject to seasonal flooding. Archeological finds in the Betuwe region have included many skeletal remains of horses, lending weight to the ancient commentaries on the Batavian expertise with horses, unlikely though it may seem considering their marshy homeland. Most Batavi lived in small agricultural settlements of up to a dozen houses. Their main town was Batavodurum Noviomagus, present day Nijmegen. Tacitus describes one of the earliest accounts of the Batavi acting as a kind of amphibious shock troop at the battle of Idistaviso in 16 A.D. The Cherusci federation, under Rome’s arch enemy Arminius, finally accepted battle against a Roman army under Germanicus. Arminius had taken up a defensive position on the Weser river, possibly near the present day village of Stauwiesen. The Batavi, led by their war-leader Chariovalda (Harold, possibly more of a title than a name; it means war leader, although it is a personal name of a number of Saxon and Scandinavian kings in later times), crossed the river but were counter-attacked. Chariovalda formed a shield-wall, but found himself surrounded. “Chariovalda, after long sustaining the enemy's fury, cheered on his men to break by a dense formation the onset of their bands, while he himself, plunging into the thickest of the battle, fell amid a shower of darts with his horse pierced under him, and round him many noble chiefs. The rest were rescued from the peril by their own strength, or by the cavalry which came up with Stertinius and Aemilius. However, this loss of veteran cavalry was one Romans could ill afford. Batavians also made up a contingent of the emperor’s horse guards, and a tombstone exists of a certain Indus, a Batavian who served as one of Nero’s bodyguards. However, the Batavians under their war leader Julius Civilis and the prophetess, Veleda, led a major revolt rule during the chaotic civil wars of 69 to 70 A.D. — Imperial Rome’s Sepoy Revolt. The Veleda (again, this is likely a title, including the root word Vala, the pantheon Germanic fertility gods) lived isolated in a tower in a deep wood in the territory of the Bructeri on the east side of the Rhine. No man was allowed access, and all communications had to go through her attendant priestesses (perhaps the Rapunzel story is preserves a memory of this ancient cult). Her influence turned what was really a side struggle into a dangerous anti-Roman war. 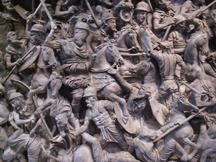 Roman cavalry at war, from a sarcophagus lid, Museo Nazionale di Roma. In any case, the revolt was suppressed and Batavodurum was burnt. 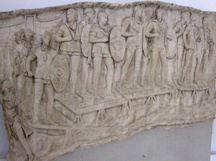 The Roman fleet and other reinforcements from Britain played a key role. It appears that the Batavians were treated relatively leniently with a return to the status quo ante bellum, although the X Gemina legion was now garrisoned permanently at Noviomagus, and the Batavians were required to replace the eight cavalry cohorts lost during the revolt. The Batavi never revolted again, and the Batavian presence in Britain proved to be a permanent one. A number of altars and gravemarkers of Batavian cohorts have been found along Hadrian’s Wall, dating from the 2nd and 3rd centuries. Along with military settlements of Frisian auxiliary veterans (the Frisii bordered the Batavian island to the north), a German military presence in Britain was already well established before the major Anglo-Saxon invasions after 450 A.D. The Batavians are last mentioned as a separate people in 355 A.D. during the reign of the emperor Constantius II. Thereafter, it appears that the Batavi became part of the tribal federation that came to be known as the Salian Franks. ORDER QUEEN OF THE CELTS TODAY!